You may (or may not) have noticed that I haven't been here for a couple of weeks. Two weeks ago I received a call that would rock my world, although at the time I didn't know it. About three years ago my grandfather was diagnosed with Multiple Myloma. We knew there was no cure, but the doctors said they could hold it off for a little while. In fact they were able to get it into remission through chemo, and for a while everything was good. 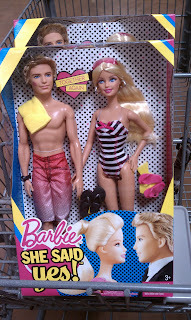 The box contains both the Ken and Barbie doll. That makes them $2.50 each! I thought it was a great deal, and grabbed up one for each of my girls. I think they will either be wrapped up as Valentines Day gifts or saved for Easter baskets. They were located on an end cap in the Toy department and were not in the regular Barbie section. I also saw some Garnier Fructis two packs in the store's clearance section marked down to $2.84. They contained both a shampoo and conditioner. I didn't have my coupons with me (I know, bad couponer) so I will have to go back tommorow to get some. It looked like they had several.